The Eric Redd Movement is a funk-driven group led by recording artist and dance music Super Star, Eric Redd. The music of his band, the Eric Redd Movement, has been described as “a unique collage of funky electronic pop melodies that will keep everyone in a frenzy on the dance floor all night.” Eric Redd was the featured entertainer opening for Stevie Wonder at the second inauguration of President Barack Obama. He has shown a knack for hitting Billboard’s dance club chart, scoring a hits with “Breathe” and “Right Time”. 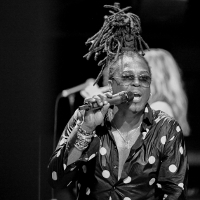 Eric’s live show is described as a mixture of Lenny Kravitz meets Rihanna with Chic. Redd’s dance moves keep the energy high and the audience uplifted!